Hong Yuan is an associate professor of marketing at the Lundquist College of Business. Yuan earned her master’s degree in applied economics and her PhD degree in marketing from the University of Michigan. 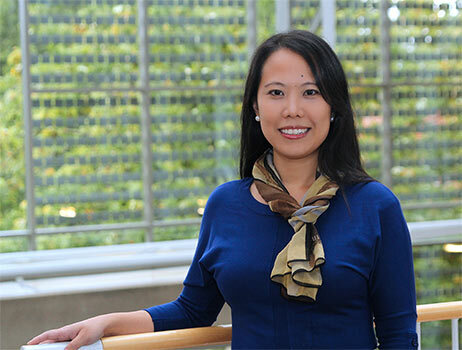 Her research interests include firms’ pricing and promotion strategies; consumers’ responses to pricing and promotion strategies; consumer information search; and experimental and behavioral economics. She has published in the Journal of Consumer Psychology, Journal of Marketing Research, Management Science, Journal of Retailing, and Journal of Advertising. She also teaches the Marketing Research course for the masters of science in Sports Product Management program in Portland. The Lundquist College is delighted to welcome six new professors, instructors, and staff members in fall 2013. The upcoming academic year promises to be a period of unprecedented activity and growth for the college. Reich, Brandon and Hong Yuan. “A Shared Understanding: Redefining ‘Sharing’ from a Consumer Perspective.” Journal of Marketing Theory and Practice, forthcoming. Kulkarni, Atul, Cindy Wang, and Hong Yuan. “Boomerang Effect of Incentive Reminders During Shopping Trips.” Journal of Consumer Marketing, forthcoming. https://doi.org/10.1108/JCM-07-2018-2783. Warren, Nathan, Sara Hanson, and Hong Yuan. "Feeling Manipulated: How Tip Request Sequence Impacts Customers and Service Providers." Marketing Science Institute Working Paper Series 19, no. 111. Hanson, Sara, Monika Kukar-Kinney, and Hong Yuan. "Friends with Benefits: Social Coupon as a Strategy to Enhance Customers' Social Empowerment." Journal of the Academy of Marketing Science 46, no. 4: 768-787. https://doi.org/10.1007/s11747-017-0534-9. Yuan, Hong, Nathan Warren, and Sara Hanson. "The Impact of Changes to Tipping Norms at The Organizational Frontline: A Comparison of Pre-Service and Post-Service Tipping." 10th SERVSIG Proceedings. Li, Shenyu, Rong Huang, Hong Yuan, and Qiong Zhou. “Optimizing the Effectiveness of Container Packaging Design: How Shape Influences Customer Proportion Judgments.” Applied Marketing Analytics 4, no. 1: 79-92. Kulkarni, Atul and Hong Yuan. "Construal-Level Mindsets Enhance Behavioral Persistence in Response to Incentive Valence." Journal of Behavioral Decision Making 30, no. 5: 1041-1051. http://dx.doi.org/10.1002/bdm.2020. Hanson, Sara and Hong Yuan. "Using Social Coupons to Enhance Customers’ Social Empowerment." Marketing Science Institute Working Paper Series. Kulkarni, Atul, and Hong Yuan. "Effect of Ad-Irrelevant Distance Cues on Persuasiveness of Message Framing." Journal of Advertising 44, no. 3: 254-263. https://dx.doi.org/10.1080/00913367.2014.975877. Yuan, Hong, Miguel Gomez, and Vithala R. Rao. "Trade Promotion Decisions under Demand Uncertainty: A Market Experiment Approach." Management Science 59 no. 7: 1709-1724. https://dx.doi.org/10.1287/mnsc.1120.1652. White, Tiffany B. and Hong Yuan. "Building Trust to Increase Purchase Intentions: The Signaling Impact of Low Pricing Policies." Journal of Consumer Psychology 22, no. 3: 384-394. https://dx.doi.org/10.1016/j.jcps.2011.09.003. Yuan, Hong, and Aradhna Krishna. "Price-Matching Guarantees with Endogenous Search: A Market Experiment Approach." Journal of Retailing 87, no. 2: 182-193. https://dx.doi.org/10.1016/j.jretai.2011.04.002. Yuan, Hong, and Song Han. "The Effects of Consumers’ Price Expectations on Sellers’ Dynamic Pricing Strategies." Journal of Marketing Research 48, no. 1: 48-61. https://dx.doi.org/10.1509/jmkr.48.1.48. Yuan, Hong, and Aradhna Krishna. "Pricing of Mall Services in the Presence of Sales Leakage." Journal of Retailing 84, no. 1: 95-117. https://dx.doi.org/10.1016/j.jretai.2008.01.008. Krishna, Aradhna, Richard Briesch, Donald R. Lehmann, and Hong Yuan. "A Meta-Analysis of the Impact of Price Presentation on Perceived Savings." Journal of Retailing 78, no. 2: 101-118. https://dx.doi.org/10.1016/S0022-4359(02)00072-6.